With seating for up to eight and copious cargo room, the 2014 Chevrolet Traverse easily accommodates a family like a big, truck-based SUV but offers a more comfortable ride and better fuel economy. This alternative to rugged SUVs like the Chevy Tahoe and Suburban isn't meant for extreme towing or off-roading, but thrives hauling soccer tots and shuffling between parking lots. 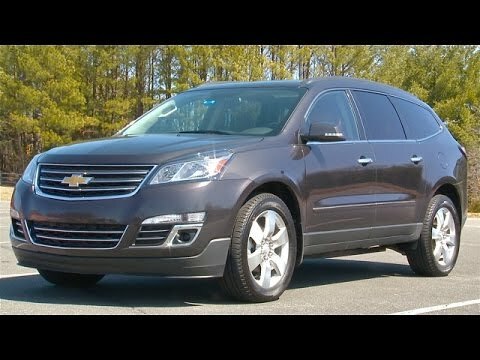 Amazingly reliable, comfortable and I love driving the traverse. . The traverse is extremely comfortable, easy to use and understand the features on the dashboard. Heated seats are a must for me know since I have had them on the traverse. It drives extremely smooth. The Bose speakers are awesome. I would say the only issue I had with the traverse was for 2 consecutive summers my air conditioner went out. It was a Freon issue. However, the dealership was fantastic and fixed it both times quickly and free of charge. They were also proactive in adding dye to it the first time just in case it wasn't completely fixed. The dye allowed them the following summer to find the hairline fracture that was causing the issue and they missed the first time. Very reliable vehicle which will last for a long time with proper maintenance. I love the car for its reliability. This is the no-frills, basic model and it serves me well. My biggest issue is accessing the third row and the seat slides. The seat does not fully move forward in the middle row so as to create enough clearance to get into the 3rd row easily. The sliding mechanism in the floor for the seats are these large, gaping slide rails that create this gaping cavern in the floor which catch every piece of food and small items that fall to the floor of the car. After three years my slide rail mechanism for the state are so filled with junk that call down there and I was not able to remove with my fingers or a vacuum cleaner. It's great on gas and it has a lot of room. I can fit so many people in my car including multiple car seats. It only takes around $40 to fill my car up depending on the price of gas. Much cheaper than my husband's truck. My car is really nice. I haven't had very many mechanical problems with this car. I like the 3 row seating. I like the way the dash is set up. I like how efficient it is on gas. I don't like the security system. Sometimes it goes crazy if you don't lock or unlock the car a certain way making it lock the whole car down and it won't even start. Then I have to play detective on how to shut the security off so I can drive my kids to school. Of the mechanical problems I have had they have all been sensor issues. It seems like all the sensors go out quickly.